Boxcutters, Teaspoons, Jigger, Citrus Juicer, Strainer, Stirrer (long Spoon), Saucers, Highball Glass. On a small plate, mix together a bit of brown sugar and granulated sugar until evenly mixed. Dip the rim of the glass in a little bit of water, and then the sugar mixture until rim is coated evenly. Add ice to glass. 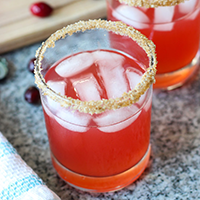 Over ice, pour tequila, cider, cranberry juice, and orange juice and stir until combined.